Imlek 2012: I turned 1/8 Chinese! I am a big fan of diversity. I’m also a hater of racism. I proud of my heritage, of my dark complexion, of my hair and eye colors, and of my genetics. 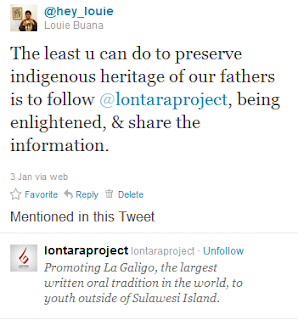 I always believe that I am 100% native to the Jewels of Equator: my father is pure Mandarese (however, according to his uncle’s wife lontaraq our extended family was actually coming from Luwu. 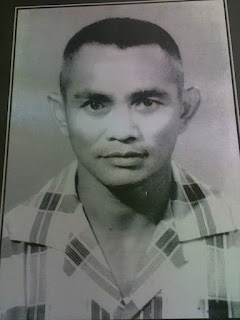 One of his great grandmothers was called We Datu ri Larompong, Sovereign of Larompong) and my mother is half Java and half Bugis (Makassar?). Not like others who are so proud of their mixed blood with foreign elements (such as Chinese, Arabian, Pakistani, India, or Dutch), I embraces my nativity and I’m totally fine with that. I always refer myself to either Javanese or Sulawesi culture on determining my own identity. But this morning, I might add some new “ingredient” on the bowl of my family’s DNA. I started this morning and realized that today is the Chinese New Year. Of course, as a tolerant sympathizer in Bhinneka Tungga Ika Archipelago, I updated my facebook’s status saying happy new year for my fellow Chinese friends. Not so long after I posted it, one of my cousin (from mother’s side) who live in Makassar replied and said that our family actually has a Chinese heritage from Pak Hartono (my mom’s dad). It was followed by posts from Nanda & Rani (my biological sisters), they protested that because we never heard such story from our mother. My cousin resisted, she said that the story is true, being confirmed by Opa Yono (his late grandfather, which is my mom’s uncle) that every Imlek morning Opa Yono always tell her the same story about Pak Hartono’s past. I don’t hate Chinese people, but receiving this fact on Imlek is just... shocking, you know. 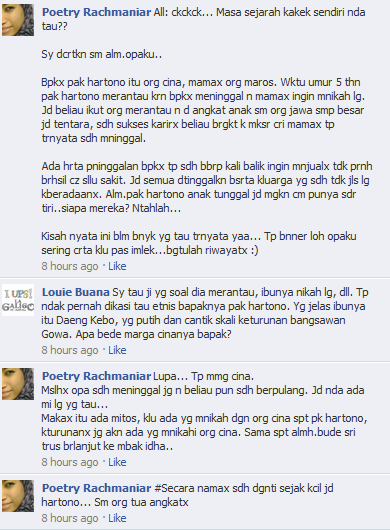 Is that why my cousin in Kediri being called as ‘Singkek’ by his bully-friends? And is that why many my other cousins have slanted eyes and light complexion when they were little? Some Chinese teenagers in Makassar didn’t catch my symphaty at all because they acted like they owned the city, dress better, rich, more cultured, and blah blah blah. I’m not generalizing them, but somehow I found irony on their petition to be treated equally; they still makes special school and special housing which is separated from the local community. At least I could be proud that my great great grandfather was married to a native woman named Daeng Keboq (and possibly the member of Gowa’s court due to her “Padaengan” title) and mingled with the society in Maros, South Sulawesi. The Chinese traders started to come to Makassar when the city arouse. 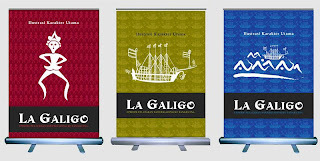 Its becoming important port amidst Indonesian archipelago post Malay colonization by the Portuguese. Began in 17th until 19th Century, many Chinese immigrants live in surrounding area, including Maros. Probably my Chinese ancestors were one of these traders that settled down in the Island. Another theory, the Chinese already made relationship with Bugis people hundred of years ago, if we interpret Princess We Cudai of Ale Cina as real royal from mainland China, not Cina in Pammana. Regardless where am I truly come from or what my heritage is, I respect my forefathers that bravely sailed into unknown land and made a step to build intercultural relations. Thank God I’m here, the fruit of their successful journey, I conclude. Okay, maybe it’s too late for me to talk about this 2009’s documentary, but there is no thing such “too late to share”. Agreed? Nia Dinata, the director of “Arisan!” produced a beautiful yet so inspiring documentary about Indonesian Female. In collaboration with Kalyana, NGO which support women’s rights in this country, they composes four short stories telling about the reality that women must face nowadays. The stories are diversed; from lesbians couple of migrant labours in Hong Kong to Pap Smears’ check crisis among sexually active females in big cities. One which caught my attention the most is about a mother of three that works as stone-cracker in the morning and prostitute at night. On East Javanese small village, live a woman with three cute little children. She got divorced, and she must work hard in order to sustaining the life of her kids. Her ex-husband only sent her Rp 4.000,00 per week, in which couldn’t even get her daughter a popsicle (if you bought it in capitalistic common mall and convenient store). 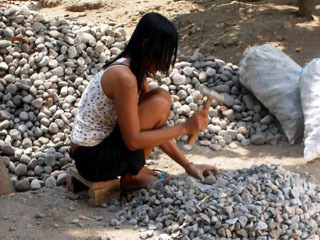 She work all day to crack ‘batu kali’, but due to the share-benefits procedure with her co-workers, she only get Rp 340.000,00 per month (for three children?! Geez... thats sad!). In addition to fulfill the daily needs, she work again at night, as a prostitue in Chinese Cemetary well known as Bolo. Wait, what?! No, I wasnt trying to make fun of her or her condition. Swear to God, I was crying while watching the documentary. Its just, I told this story in the most ironic way. A mother of three, end up in prostitution to fulfill her children needs due to poverty is a serious topic. It opens my mind, it shows a different perspective toward seeing whores and hookers. They, who’ve been judged with damnation and certified as Hell-Club members have stories, just like us. It must be a big deal in their life to end up throwing wee-wee for dirty and sweaty bald-headed nasty men. Some of them maybe longing to be a diplomat, restaurant manager, or happy wife with a cute Brad Pitt-ish smiled husband. Should we blame God for this situation? For His plan toward these people? No. Blaming God is the lamest way to excuse life. I would rather blaming our f*cking governments rather than the capital H-I-M. These rats (read: corrupt people in national government and stinky capitalist company) runs this country. They took our money and let low-class people suffered the most. Where the heck is Pasal 34 Undang-Undang Dasar 1945 gone? Are they ammended the word “fakir miskin” and “anak-anak terlantar” to “keluarga anggota pemerintahan” and “swasta pemilik modal” already? Already?! If the government is honest and we are not fighting corruption nowadays, we’ll enjoy at least a fitting standard of living condition. United States is ranked 1 level higher than us on total of population. Despite the fact that they’re facing financial and morality crisis right now, the government could still manage to give people free access to health, education, and even financial supports. This country, that has uncountable richness from its natural resources and amazing amount of population is dying. 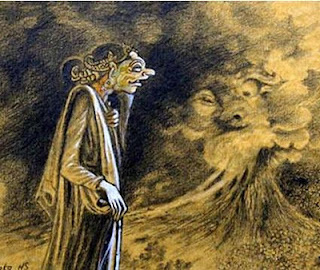 The greediness of those rats lead us to poverty which covered with G20 meetings and Piramida Garut. Im so pissed and sad. To whom shall we protest for that woman and her three children condition? There are alot of inhumanic stories in this country. Above the whole, all that our president can do is whining and writing lyrics. The last one, for those FPI who has such a magnificent desire to beat non-Muslims, you guys better becoming polygamist and married those unfortunate widows. Thats better for them, rather than end up in hopelessness as prostitutes. Thats also better for you guys, our prophet has set it as one of his greatest example. A way to resolve social problem, rather than carrying sticks to spread horror to the Hindus, Buddhists, Christians, Ahmadiyas, Shiites and your other fellow Muslims. Duryudana : caranya bagaimana Paman? Sengkuni :kita buat isu pencaplokan wilayah, mereka itu terkenal cinta tanah air. kedua, mereka itu mewakili trah Pandawa dan Dwarawati, kalau mereka sudah berperang, artinya lawan kita sudah hancur. ketiga, mereka itu satu agama, tapi beda aliran, ini potensi konflik yang mudah disulut. Durmagati : Oooo Paman Cengkuni itu kalo yang berbeda, perbedaan, ulayat, khilafiyah, itu kok paham cekali. 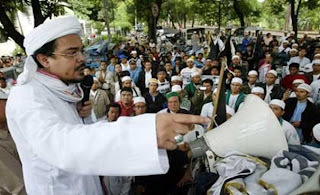 Sengkuni : Loh .. itu kan bekal gelar Doktorku, aku ini belajar pluralisme. Ok.. kembali ke masalah, kalau kikis Tunggarana yang kaya minyak itu sudah tidak bertuan, nah baru kita memanfaatkan mendirikan tambang, kita klaim bahwa kita yang menyelamatkan bumi Tunggarana. Duryudana : Enggeh Paman, saya menurut kata Paman Sengkuni saja. What do you guys think? Sampai kapan kita yang katanya berasal dari trah yang sama ini dipecah-pecah oleh perbedaan? Bukankah Tuhan telah menentukan kita diciptakan bersuku-suku dan berbangsa-bangsa untuk saling mengenal (Al-Hujuraat: 13)? Jika kita menganggap perbedaan sebagai musibah, bukannya anugerah, berarti kita rela untuk dibodoh-bodohi tokoh hina seperti Sengkuni. Atau bahkan, kita memang secara naluriah memiliki mind-set seperti Sengkuni? Masihkah engkau ber-Bhinneka Tunggal Ika? Awalnya, saya mengajak saudari Sri Maharani (Ran) untuk membuat sebuah gerakan yang bertujuan untuk memperkenalkan La Galigo kepada publik Indonesia. Kira-kira kejadiannya di pertengahan tahun 2010, ketika saya baru saja kembali dari Amerika Serikat untuk kedua kalinya. Melalui Whatsapp, kami saling bertukar ide, diskusi, dan saling gontok-gontokan memikirkan konsep proyeknya. Akhirnya kami sepakat untuk mengumpulkan data tentang La Galigo sebanyak-banyaknya, mengajak beberapa orang lainnya sebagai “nahkoda” utama proyek ini, serta berencana untuk menciptakan sebuah web ramah-pemuda sebagai main media kami. Saya lalu approach kepada dua orang lainnya: Setianegara (Ega) dan Fitria (Fit). Kenapa Ega? Well, pada waktu itu saya yakin si pemalas yang berkuliah di ITB ini punya otak yang encer, punya semangat untuk mengangkat harkat-derajat-martabat nenek moyangnya (dia aktif di UKSS lho), serta bisa diandalkan klo masalah web-weban. Saya akui dia memang orang yang pintar, tapi sifatnya yang nyebelin itu loh... Ampuuun Karaeng... >_<. Lanjut, liburan puasa 2010 kemarin kebetulan Fit sering main ke rumah. Posisinya sebagai junior saya di SMP dan AFS membuat kami sudah lumayan akrab. Saya pun percaya kemampuannya. Dengan latarbelakang subyektif tapi profesional inilah kemudian saya menggaet dia untuk memperkuat team kami. Singkat cerita, dalam waktu yang relatif cepat (karena memanfaatkan momentum liburan semester + puasa) kami berempat berkumpul di rumah saya di Makassar. Dengan segera kami bagi tugas: Ran menghubungi ibu Nurhayati Rahman (dosen Sastra Daerah Unhas yang terkenal sebagai kaliber di dunia peneliti La Galigo dan telah banyak menerbitkan buku) serta saya dan Ega ke Laboratorium Sastra Unhas untuk mengumpulkan informasi. Ternyata Ran tidak berhasil menyerap banyak data dari sang maestro karena beliau terburu-buru hendak ke Malaysia sebagai dosen tamu (namun kami amat berterima kasih atas pemberiannya berupa dua buah buku gratis tentang La Galigo). Kami pun hampir patah semangat karena informasi di Laboratorium Sastra Unhas tidak sebanyak seperti yang kami harapkan sebelumnya (bisa dibaca di web). Tapi alhamdulillah, puja dan puji hanya milik Allah... Dengan penuh cucuran darah, komunikasi jarak jauh via YM (kami berempat terpencar di Jogja, Jakarta, dan Bandung) serta kata-kata pedas via grup facebook, kami dapat melahirkan proyek ini. 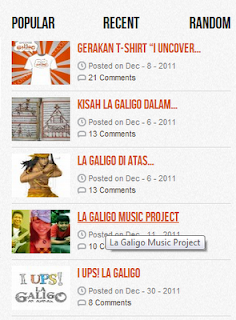 Tanggal 31 Desember 2011 menjadi momentum besar: lahirnya LONTARA (LA GALIGO FOR NUSANTARA) PROJECT! Yaaay!!! Hari ini tepat satu minggu sejak launching web kami. Pengunjungnya so far sudah menyentuh angka hampir 1.000 visitors. 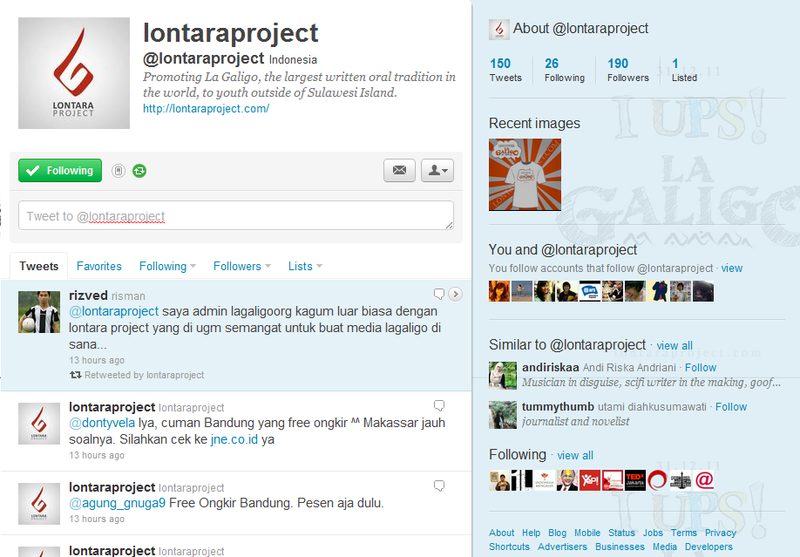 Twitter kami pun sudah punya 187 followers. Kami optimis jumlah ini masih akan terus bertambah. Animo masyarakat Sulawesi Selatan ternyata amat besar. Banyak teman-teman saya di Makassar yang amat supportif terhadap gerakan kami ini. Demikian pula dengan ibu Nurhayati yang memberikan restunya kepada kami lewat email. Rekan-rekan saya di Indonesian Future Leaders, AFS, BPPM Mahkamah pun amat sangat positif. 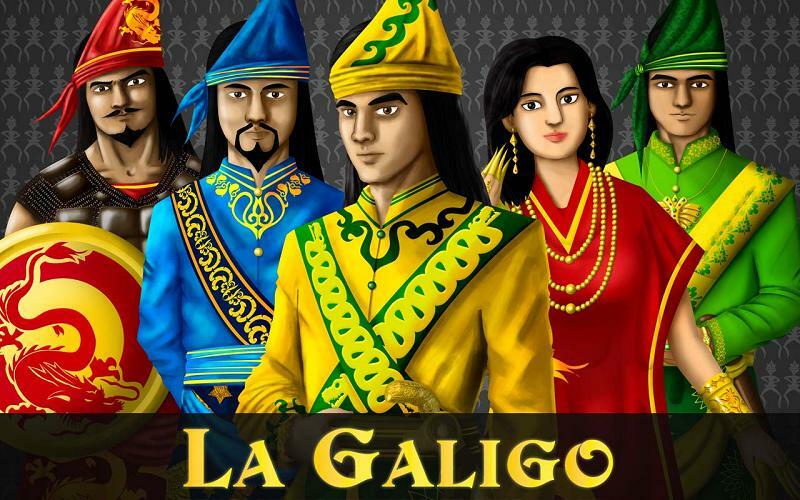 Sebagian bahkan ada yang membantu menyebarluaskan informasi mengenai La Galigo melalui jaringan mereka. Sebagian ada yang sudah tidak sabar ingin terjun ke aktifitas nyata untuk menyelamatkan Memory of The World dari UNESCO ini. 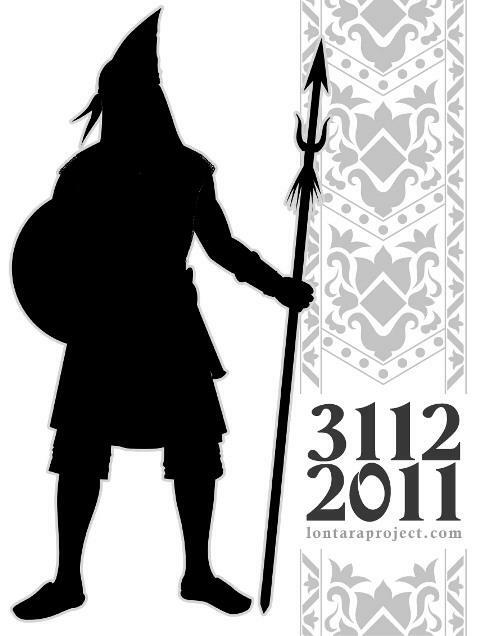 Dibalik segala euforia LONTARA PROJECT tadi, tentunya ada pula tantangan-tantangan besar yang harus kami hadapi. 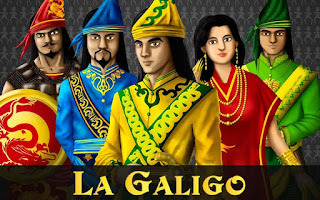 Tantangan pertama ialah sinisme dari kalangan yang merasa memiliki La Galigo atau bahkan merasa sebagai pemilik budaya Sulawesi Selatan. respon yang muncul seperti “berani-beraninya kalian bikin web dengan informasi cuma seuprit kayak begini! 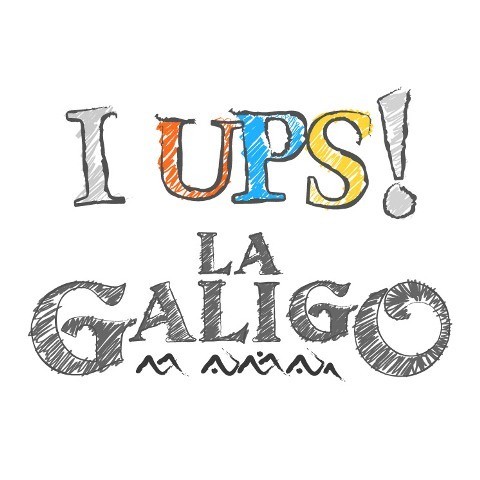 Saya yang tahu lebih banyak aja nggak sampai bikin gerakan macam kalian”, atau “La Galigo itu udah populer kok. Saya ikutan ngepopulerin lho, lewat seminar-seminar dan tulisan akademik. Jadi sebenarnya nggak usah pakai gerakan ini juga La Galigo fine-fine aja”. Yang pertama itu muncul dari golongan tua. Dengan segala kerendahan hati, saya mengakui kadar keilmuan serta pengalaman hidup beliau. Saya tidak meragukan, beliau pasti telah melanglang buana mencari tahu, membaca, serta berdiskusi tentang La Galigo dari pakar-pakar handal. Tapi saya kurang setuju jika kami disalahkan karena tampilan kami yang memang “terlalu sederhana” dalam menyajikan informasi tentang La Galigo. Pasalnya, selain karena kondisi kami di rantau yang serba terbatas dari akses langsung ke data-data mengenai La Galigo (kebanyakan di Sulawesi Selatan, tentunya) jika kami tidak dengan “nekat” meremajakan La Galigo kepada generasi muda non-Sulawesi, lantas siapa dan kapan lagi? Apakah kami harus menunggu tangki terisi penuh sementara generasi tuanya tidak tahu bagaimana cara berhadapan dengan anak muda di zaman revolusioner seperti abad 21 ini? Terus terang saya sedikit kecewa. Kritik-kritik di atas tidak melemahkan kami, tapi justru membuat kami semakin kuat dan maju. Saya sendiri sadar, proyek kami ini tidak main-main. Apa yang kami lakukan ini akan memiliki efek besar terhadap bangsa ini dalam memandang dirinya sendiri dari dalam. PR terbesar kami sebenarnya adalah bagaimana membuat pemuda Sulawesi Selatan yang di-cap anarkis oleh orang Indonesia lainnya untuk tampil dengan La Galigo sebagai trophy kebudayaan adiluhung mereka. Proyek ini juga merupakan somasi kepada seluruh pemuda nusantara yang “international oriented” tapi tidak “local genious oriented”. Mereka baru akan protes dan marah-marah lewat media sosial ketika batik atau karya warisan bangsa lainnya diklaim negara orang. 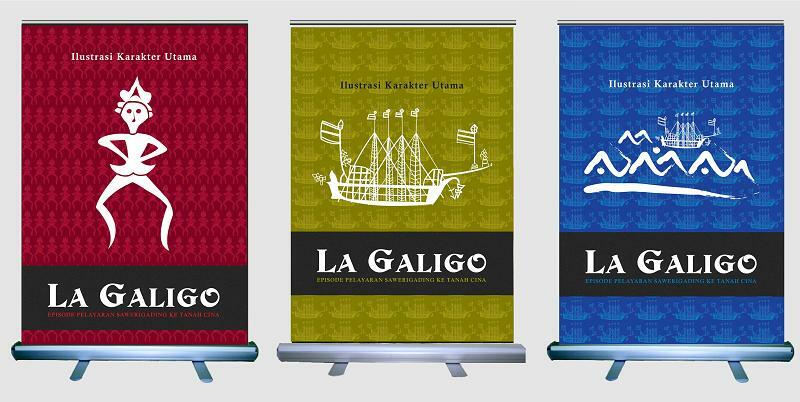 Melalui proyek ini, kami harap agar mata bangsa Indonesia terbuka bahwa di pelosok-pelosok daerahnya ada banyak mutiara kearifan lokal yang menuntut untuk dibudidayakan. 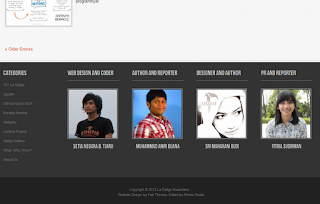 Semoga my dear readers sehat selalu dan punya waktu untuk mengunjungi web serta ikut berpartisipasi dalam program-program kami di masa mendatang. Yesterday was the best way to end 2011 and to welcome 2012 in Yogyakarta. Three years in a row I've been having New Year's Eve celebration with the AFSers. Will talk about the details as soon as I get the chance to upload some pictures (keywords: Lontara Project Soft Launching, Kasongan Art Festival, and "Flames on Mt. Sinai" a.k.a. Monjali's Fireworks). Dare to save the longest epic in the world? Show us your youth spirit on preserving ancient tradition in a very modern-creative way! 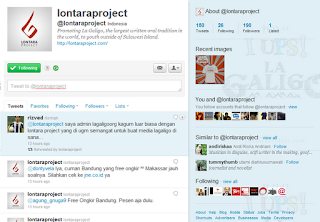 Visit www.lontaraproject.com and follow our twitter @lontaraproject. Say it out loud: "I UPS! 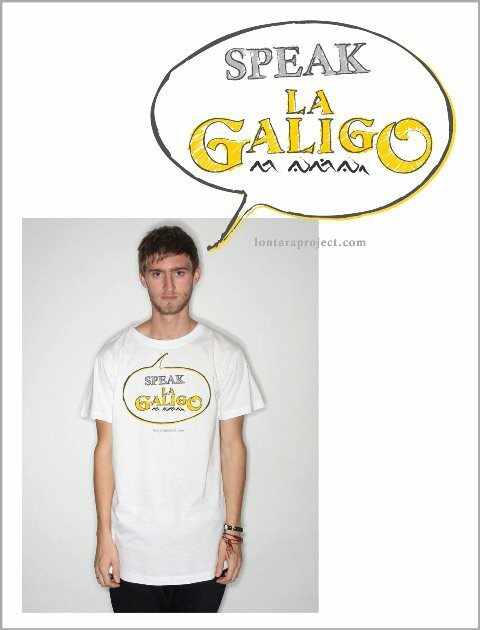 (Uncover-Preserve-Speak) LA GALIGO".